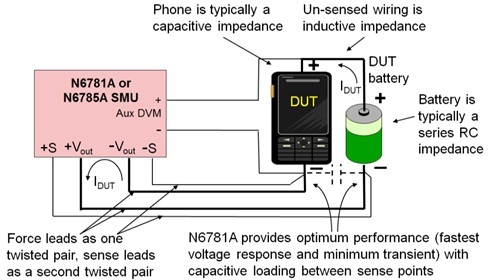 Two years ago I added a post here to “Watt’s Up?” titled: “Zero-burden ammeter improves battery run-down and charge management testing of battery-powered devices” (click here to review). In this post I talk about how our N6781A 20V, 3A 20W SMU (and now our N6785A 20V, 8A, 80W as well) can be used in a zero-burden ammeter mode to provide accurate current measurement without introducing any voltage drop. Together with the independent DVM voltage measurement input they can be used to simultaneously log the voltage and current when performing a battery run-down test on a battery powered device. This is a very useful test to perform for gaining valuable insights on evaluating and optimizing battery life. This can also be used to evaluate the charging process as well, when using rechargeable batteries. The key thing is zero-burden current measurement is critical for obtaining accurate results as impedance and corresponding voltage drop when using a current shunt influences test results. For reference the N678xA SMUs are used in either the N6705B DC Power Analyzer mainframe or N6700 series Modular Power System mainframe. There are a few considerations for getting optimum performance when using the N678xA SMU’s in zero-burden current measurement mode. The primary one is the way the wiring is set up between the DUT, its battery, and the N678xA SMU. In Figure 1 below I rearranged the diagram depicting the setup in my original blog posting to better illustrate the actual physical setup for optimum performance. Note that this makes things practical from the perspective that the DUT and its battery do not have to be located right at the N678xA SMU. However it is important that the DUT and battery need to be kept close together in order to minimize wiring length and associated impedance between them. Not only does the wiring contribute resistance, but its inductance can prevent operating the N678xA at a higher bandwidth setting for improved transient voltage response. The reason for this is illustrated in Figure 2. By following these best practices you will get the optimum performance from your battery run-down test setup!